The joy of riding a motorcycle can end in an instant if a dangerous road condition causes the driver and any passengers to fall off their motorcycles. Unlike cars and trucks, most motorcycle accidents cause serious injuries or death because there is virtually nothing to protect the rider. Dangerous road conditions that cars and trucks can easily endure can cause a motorcycle to lose control and crash to the hard asphalt. 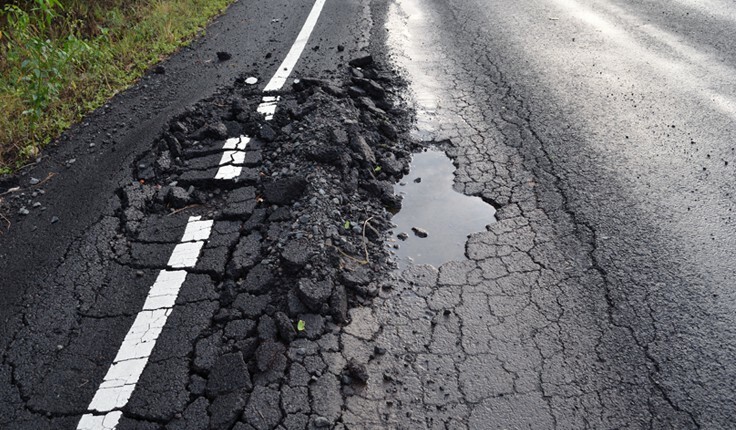 Potholes, roadkill, oil slicks, changes in lane surface, and many other problems can cause a catastrophe. At Harris Lowry Manton LLP, our Atlanta motorcycle accident lawyers hold governmental agencies, contractors, and others accountable if a defective design or a failure to maintain the road caused the motorcycle crash. We represent injured operators, passengers, and the families of deceased riders in federal and state court. Legal firms across Georgia and the Southeast refer accident cases to our lawyers because we have earned a reputation for getting justice for our clients. Irregular roads. Roads that are not level, highways that have not been repaired after a winter of bad weather or a spring of pouring rain, and roads that need to be resurfaced pose dangerous risks to all motorcycle operators. Lanes that have different heights. Sometimes one lane will be lower than an adjacent lane due to repairs, construction work, or other reasons. When the motorcycle operator passes, or needs to switch lanes, an accident can occur. Gravelly roads. Rural roads and roads that have just been fixed often have loose gravel, which can be extremely difficult for the motorcycle to avoid or ride over. Every driver of any vehicle has had to deal with potholes — some small and some much harder to avoid. For the motorcycle operator, just one pothole can cause the driver to spill, causing death or other injuries. Dead animals can lay on the road for weeks. A motorcycle simply does not have the suspension or breadth to be able to ride over a dead animal without risking life and limb. Oil slicks. After any rain, the mixture of oil and water can cause the motorcycle operator to hydroplane when the tire hits the slick. When the operator tries to steer or brake, the slick can cause the driver to slide and crash. Slick surfaces are especially dangerous when the driver is making a turn. Other road hazards include expansion joints and bridge joints, which can make it tough for the operator to navigate. Snow and ice are constant dangers in the winter. Leaves and debris, such as rocks, tree branches, and spilled cargo, are hazardous. Trolley and railway tracks can also be dangerous for motorcycles to pass over. Passenger lawsuits. If a passenger falls off a motorcycle because the operator failed to navigate a road hazard, then we can often show that the driver was negligent. Motorcycle operators should anticipate dangerous road conditions. They should avoid heavy traffic, allow for alternate routes and safe distances to avoid hitting the hazard, and should drive at slow enough speeds to manage the hazard. When operators are negligent or careless, motorcycle passengers have the right to hold the driver and the motorcycle owner accountable. Lawsuits against the government. The state of Georgia, a local county, a city, or other public entity may be responsible if they could have, and should have, designed a better road or placed appropriate warning signs. Wrongful death actions. If your loved one has been killed in a motorcycle crash, we help you find the responsible parties and hold them accountable. Public entities. The state, county, city, or other public agency that maintains the roadway might have behaved negligently if it should have known about the hazard and could have done something to prevent the problem. Sometimes, prevention is as simple as posting a warning sign. Private individuals or businesses. Other individuals or businesses might have been negligent. For example, if a biker crashes when he/she hits a tree that falls out of a landscaper’s truck on the freeway, the landscaper might be liable for the biker’s injuries. Of course, the motorcyclist’s behavior might have contributed to the accident as well. If a biker is speeding or weaving on the highway, his or her behavior may prevent recovery in a road hazard accident. Motorcycle accident claims involving road hazards can be complicated and can require advice or representation from a lawyer. The Atlanta motorcycle accident lawyers of HLM are prepared to help you through the legal process. Please call us at 404-998-8847 in Atlanta or 912-417-3774 in Savannah to schedule a free consultation, or use our contact form to make an appointment.